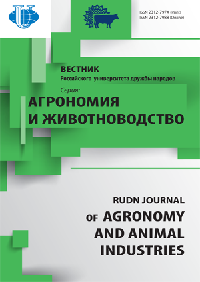 "RUDN Journal of Agronomy and Animal Industries" is intended for publication of the results of fundamental and applied scientific research of Russian and foreign scientists in the form of scientific articles, reviewing scientific materials, scientific reports, bibliographic reviews on certain topics of scientific research, historical information on figures of Russian and foreign science. The journal can publish materials whose scientific value and suitability for publication is estimated by the editorial board of the journal based on the results of peer review. Chief editor of "RUDN Journal of Agronomy and Animal Industries" - Doctor of Agricultural Sciences, Professor, Director of the Agricultural and Technological Institute of the Russian Peoples' Friendship University Plyuschikov Vadim. The composition of the Editorial Board consists of Russian and foreign experts who have made a significant contribution to the development of agriculture. 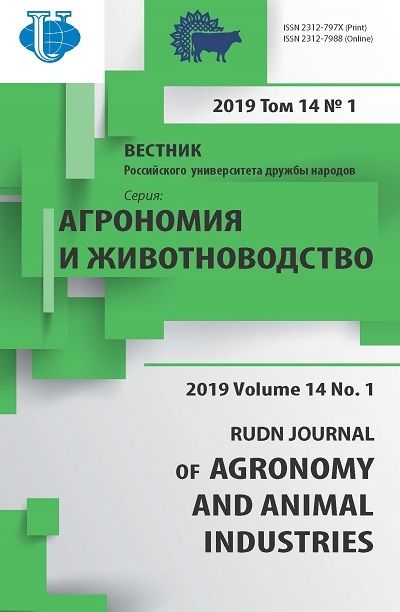 "RUDN Journal of Agronomy and Animal Industries" is on the list of periodicals, which are recommended by the Highest Attestation Commission of the Russian Federation for the publication of abstracts of dissertation research. You can subscribe to printed issues of the magazine in any post office (the agency directory "Rospechat") or in the RUDN publishing house. Since 2008 journal editions in abstract-bibliographic and full text form are available in the database of the Russian Science Citation Index on the platform of the Scientific Electronic Library elibrary.ru. Kononenko N.V., Dilovarova T.A., Kanavsky R.V., Lebedev S.V., Baranova E.N., Fedoreeva L.I. Dubenok N.N., Gemonov A.V., Lebedev A.V., Glushenkova E.V. Nikitchenko V.E., Rystsova E.O., Chernysheva A.N.